February 2, 1895 Fr. Maurus Hartmenn together with two brothers and Sr. Birgitta Korff, Sr. Klara Essmann, Sr. Afra Gillot, Sr. Bernardine Hefele opened the first mission station in Lukuledi, Tanganyika Inland. Sr Birgitta was elected first Prioress General of the Sisters’ Congregation in the same year and had to leave soon. In 1898 the community of Sisters was transferred to Nyangao due to shortage of water: Sr. Walburga Diepolder, Sr Hiltrudies Herz and Sr Viola Albrecht. Their house of sun burned bricks survived the destruction of the mission during the Maji Maji Uprising. Our Sisters are still living in the oldest house of the Congregation. August 29, 1905 the warriors of the Maji Maji war stormed the Nyangao mission and burned down all buildings. All missionaries took flight into the bush in order to reach Lindi at the coast. Sr. Bernardine Hefele, Sr. Walburga Diepolder, Sr. Avia Marschner and Sr. Helena Lettner were together with some orphan children. Sr Walburga prayed loud: “Beloved Jesus, take my life, save the others!” as Sr. Bernhardine reports. Sr. Walburga was wounded in the waist and could not follow. She was killed together with some orphans. Only part of her red belt and her Rule of Benedict were found at the site of her death, not her body. These relics are now in the archives in Rome. September 14, 1908 The Ndanda Sisters Convent was opened with Sr. Bernardine Hefele,; Sr. Helena Lettner; Sr. Hieronyma Holtkamp, Sr. Hedwig Hirschberg, Sr. Evangelista Engelns and Sr. Candida Eisele. The Sisters were engaged in caring for the sick, giving education to girls, managing all the domestic chores for the monks. In 1912 the leper colony was started in nearby Mwena. The management was given to the Sisters by the monks. Later on Sr LiaSchwarzmueller became famous with her care for the lepers for 55 years. In 1926 Sr. Dr. Tekla Stinnesbeck arrived, the first medical doctor in our Congregation. She founded the St. Benedict Hospital in Ndanda in 1927 and started soon a network of health stations in a wide area and training of African nurses and midwives. Her last foundation was Nyangao St. Walburg’s Hospital, where she died in 1962. In April 1935 Ndanda was raised to a Priory. The first Prioress was Sr. Bernardine Hefele. 1928-1944 the Hospital in Ndanda was built and expanded, run by Missionary Benedictine Sisters, working as doctors and nurses. A Nursing School was added. In 1939 the Opening of the Girls’ Middle School was a big step forward for women to take responsibility as educated persons. 1941 Nyangao was reopened again. 1942 – 46 Missionaries were deported during World War II. The Sister Nurses, a cook and the old sisters were allowed to stay to care for the soldiers. After the war new Sisters came and opened new stations closer to the coastal Islamic area: in Mtua, Kilimarondo, Mnero, Nkowe, Lindi. : They served the sick, in Schools, Kindergarten and did pastoral work. 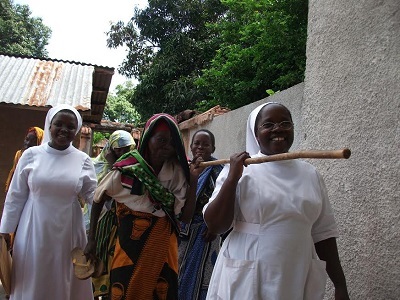 Tanzanian young women wanted to enter religious life and our Sisters were asked to help with the foundation of a diocesan congregation. In 1941 a Diocesan Congregation of Benedictine women (African Benedictine Sisters of Our Lady, Help of Christians) was founded and in the beginnings governed and formed by our Sisters. 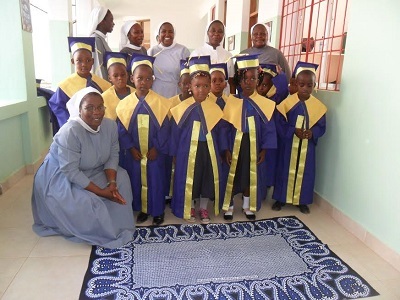 Meanwhile several hundreds of Benedictines belong to this congregation, which is active in many dioceses in Tanzania and Mozambique. 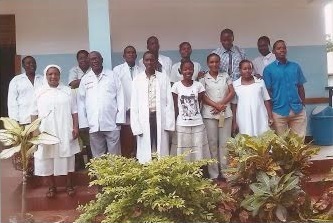 Among the apostolates started in the last years is a new Secondary School in Mtwara opened in 2008 and since then run by our Sisters. 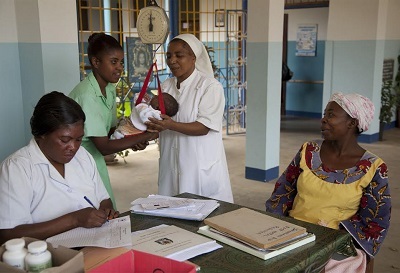 The dispensary in Mtwara city could be extended to offer as well maternity services and X-ray. A new English medium kindergarten and Pre-Primary School was opened nearby and educates a steadily growing number of children. 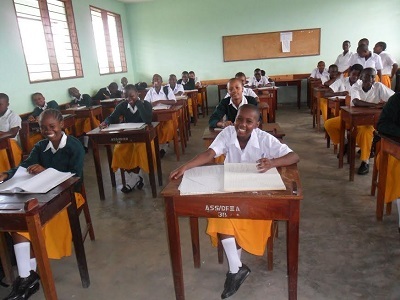 With a new Students’ Hostel for 200 female students of different training institutions of Mtwara we can offer safe accommodation conducive for studies. In 2009 our Priory dared a jump into the Northwest of the country. A new community was opened in Kabuhima, Kahama Diocese, where we meet people thirsting for the proclamation of the gospel. The Sisters are involved in the parish with 30 outstations, in the youth apostolate of the diocese and giving religious classes in the surrounding schools. In spite of being a very small priory the Sisters have trusted in the Lord to make bold steps for new apostolates, new stations and towards more self-reliance. Much emphasis was given again to the education of young women.